The "La Mannella" farm, owned by the Cortonesi family, covers a surface of 56 hectars (138 acres), eight (19 acres) of which especially devoted to the production of "Brunello di Montalcino“. Its wine-making activity started at the beginning of the seventies, and its vineyards are placed in one of the most valuable areas of the region, both north and south-east from Montalcino. It is a young company, in fact their first bottled vintage is from 1990. It is strictly a family business. And works according to the tradition, employing also modern technologies, that help enhancing the quality of the products made. The favorable location of its vineyards, and the rocky soil where they are planted, all contribute to the making of a deep and elegant Brunello, a grape well suited also for a long aging. 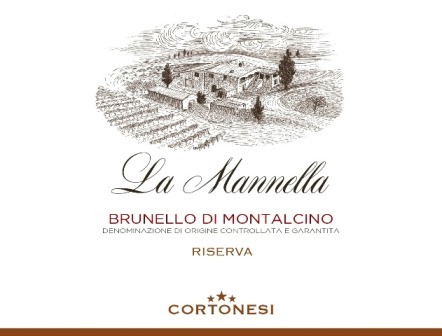 La Mannella Brunello di Montalcino is from the Montalino region in Tuscany. The family farm is especially devoted to the production of this wine. The soil type is rocky with favorable exposure with lots of sun. The vineyard trellis system is spurred cordon and the winemaking style follows tradition. The wine is aged in oak for five years in oak with an additional 10 months in bottle prior to release. A luscious, dark crimson Brunello with bountiful aromas of cherries and spice. Ripe, juicy fruit on the palate. This wine shows great balance between acidity and tannins.